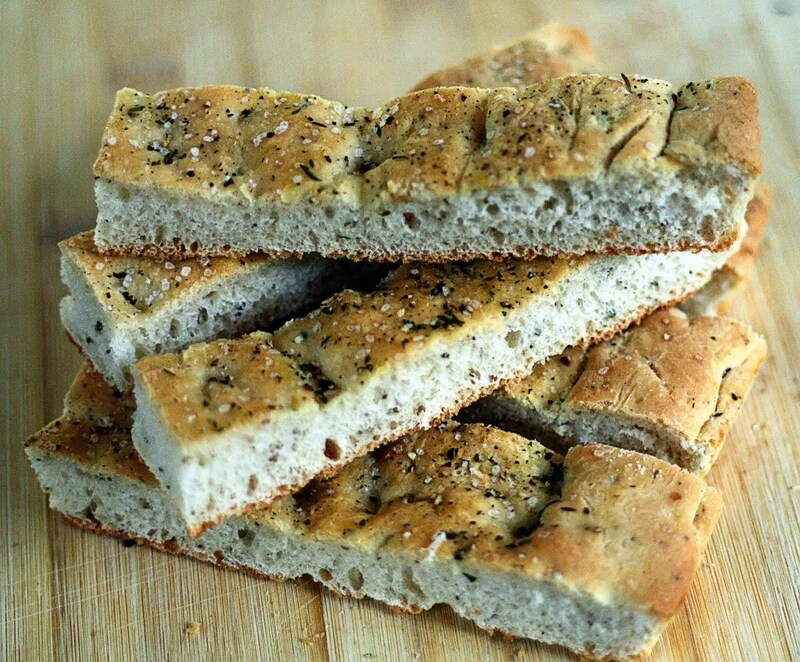 Focaccia is a type of Italian flatbread that is airy, yet dense and can be packed with flavor. I love to eat it along side hearty soups and dip it in flavored olive oil. It’s also great with hard cheeses like asiago and parmesan. 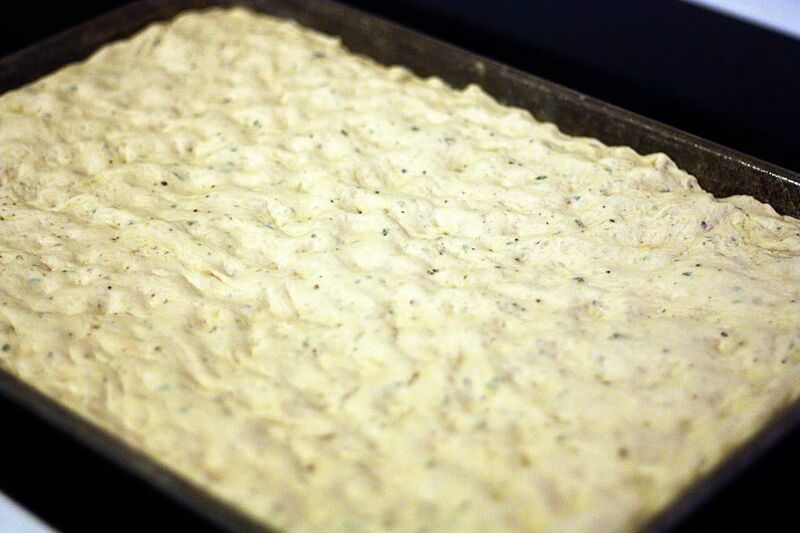 Focaccia can be used as a pizza crust or a sandwich bread…great for paninis! Combine 2 cups lukewarm water and yeast in large bowl and mix well. Mix in 3 tablespoons olive oil, cracked pepper, and 2 teaspoons salt. Stir in 1 cup flour. Using wood spoon, stir vigorously until well incorporated. Add enough of remaining 3 3/4 cups flour, about 1/2 cup at a time, to form dough that is soft, sticky, but not completely smooth, stirring vigorously until well incorporated. Oil large bowl. Scrape dough into oiled bowl. Cover bowl loosely with plastic wrap. Let dough rise in warm draft-free area until doubled in size, about 45 minutes (do not punch down dough). 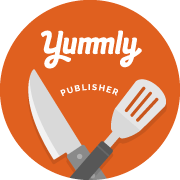 Lightly oil 15x10x1-inch baking sheet. Slide out dough onto prepared baking sheet (dough will be soft and will easily slide out onto sheet; do not punch down dough or knead dough). Gently pull and stretch dough so that dough almost covers baking sheet. Allow it to rest (untouched) for about 5 minutes. Press fingertips all over top of dough to form indentations and pressing it to the edges. 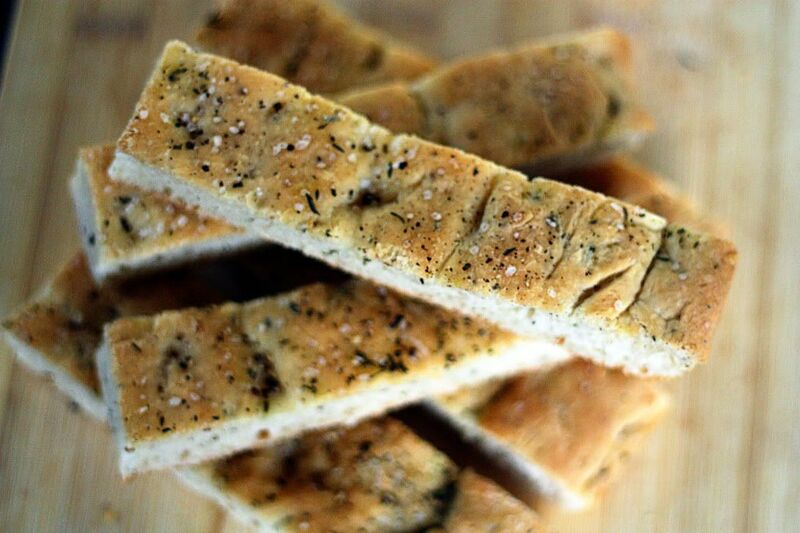 Drizzle or brush top of focaccia with remaining 1 tablespoon olive oil. 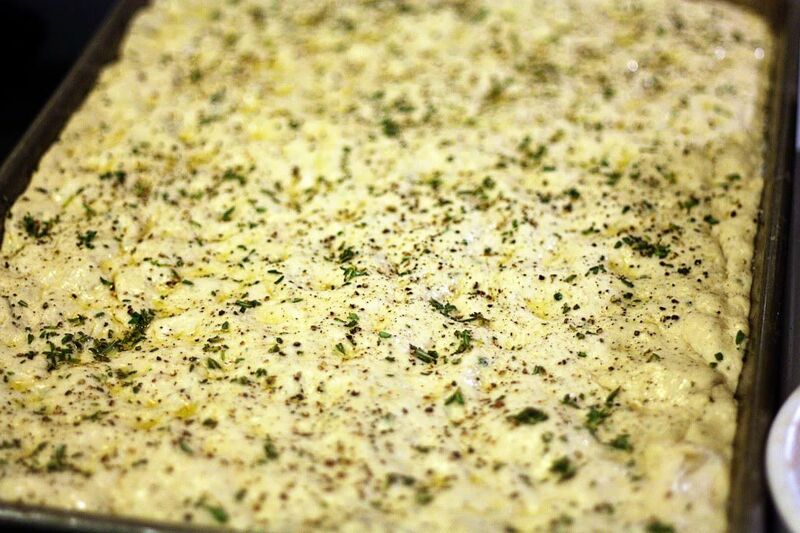 Sprinkle with thyme, rosemary, oregano, garlic and coarse salt. Cover loosely with plastic wrap. Let rise in warm draft-free area until puffed, about 15 minutes. Place rack in center of oven and preheat to 450°F. 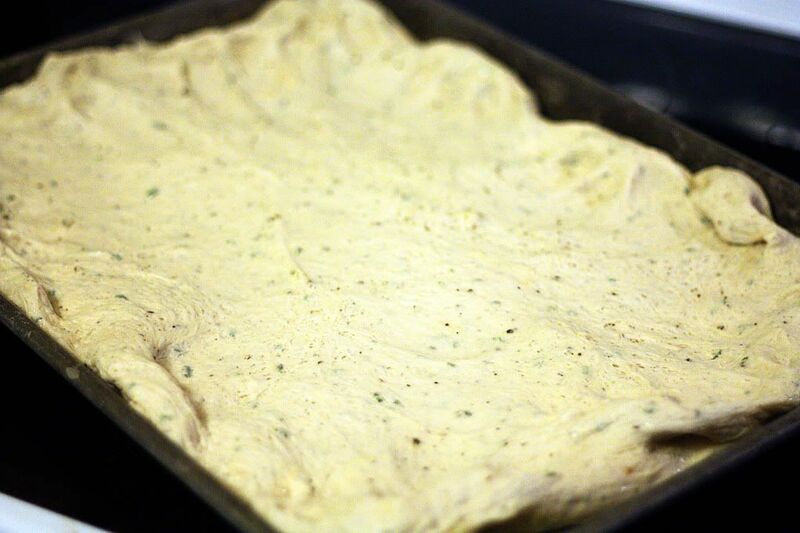 Bake focaccia until deep golden brown, about 30 minutes. Transfer to rack and cool. Combine 2 cups lukewarm water and yeast in large bowl and mix well. Mix in 3 tablespoons olive oil, cracked pepper, and 2 teaspoons salt. Stir in 1 cup flour. Using wood spoon, stir vigorously until well incorporated. 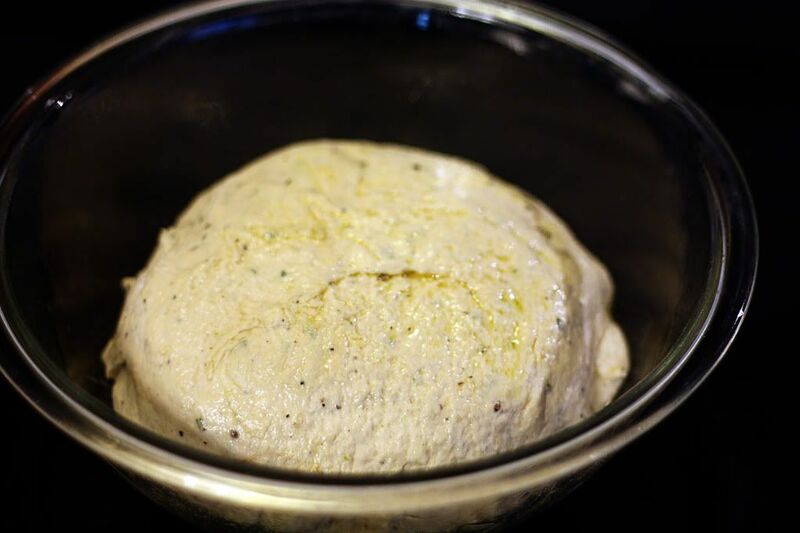 Add enough of remaining 3¾ cups flour, about ½ cup at a time, to form dough that is soft, sticky, but not completely smooth, stirring vigorously until well incorporated. Oil large bowl. Scrape dough into oiled bowl. Cover bowl loosely with plastic wrap. 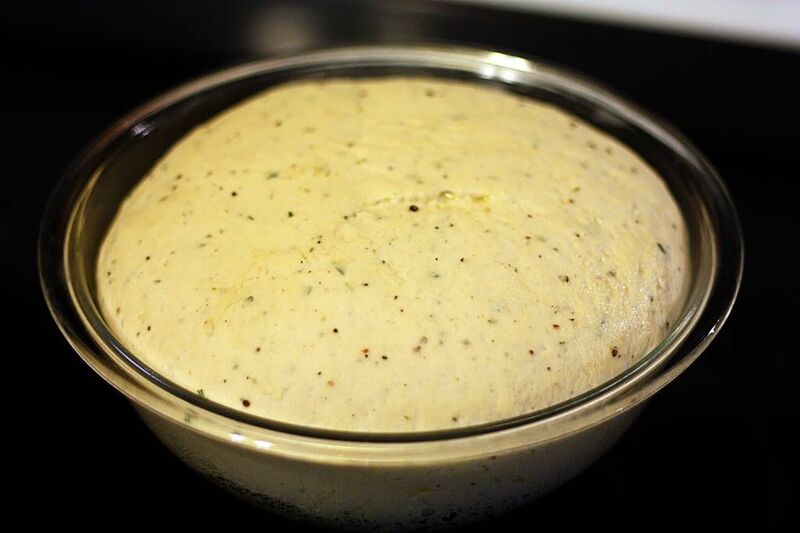 Let dough rise in warm draft-free area until doubled in size, about 45 minutes (do not punch down dough).